HOLLYWOOD, Calif., March 20, 2012 – The world-renowed Muppets received a star on the Hollywood Walk ("Wocka Wocka") of Fame today from the Hollywood Chamber of Commerce in celebration of the release of Disney's "The Muppets" on Blu-ray Combo Pack and DVD. The celebration was emceed by Chamber President and CEO Leron Gubler, with special guest speakers Rich Ross, Chairman, The Walt Disney Studios and Lisa Henson, CEO, The Jim Henson Company. 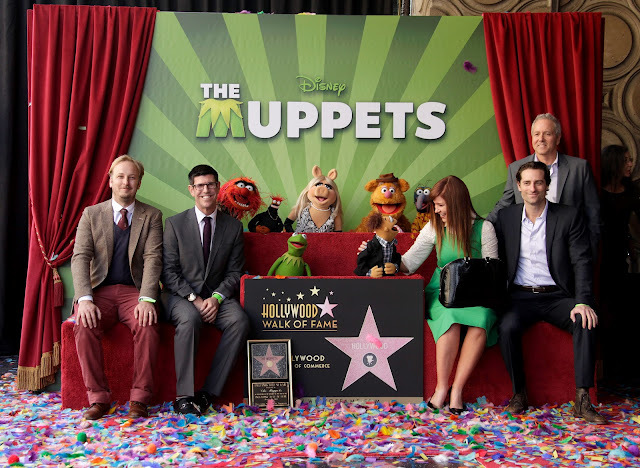 Several Muppets were on hand to receive the star including Kermit the Frog, Miss Piggy, Fozzie, Gonzo, Animal, Pepe, Sweetums, and Walter, the newest Muppet, who made his debut in Disney's 2011 film. The Muppets' star is the 2,466th star on the Hollywood Walk of Fame and is located in front of the historic El Capitan Theatre. 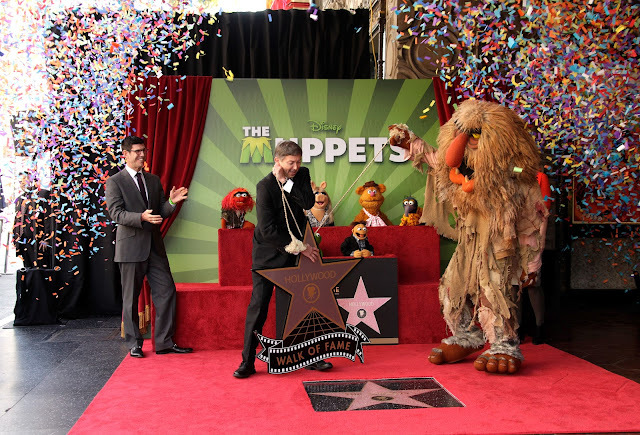 "Thanks to creative genius Jim Henson and these extraordinary puppeteers, the Muppets are truly worldwide icons and Hollywood stars," said Ross. "They are a treasured part of the Disney family, and we're thrilled to see them join so many other luminaries on the Hollywood Walk of Fame." What began with Kermit’s first TV appearance in 1955, has lead to a global phenomenon that is still going strong more than 50 years later! Since “The Muppet Show” began in 1976, audiences worldwide have embraced the Muppets. With the success of “The Muppet Show,” the Muppets branched out to the big screen, releasing their first feature film, “The Muppet Movie,” in 1979. The film starred a myriad of actors, including Bob Hope, Cloris Leachman, Steve Martin, Mel Brooks, Richard Pryor and Paul Williams. This impressive list of celebrity cast and cameos became the hallmark of all Muppet films, six of which followed, including “The Great Muppet Caper” (1981), “The Muppets Take Manhattan” (1984), “The Muppet Christmas Carol” (1992), “Muppet Treasure Island” (1996) and “Muppets from Space” (1999). The latest film, “The Muppets” (2011) follows Walter, the world’s biggest Muppet fan, his brother Gary (Jason Segel) and Gary’s girlfriend, Mary (Amy Adams), from Smalltown, USA, as they head to Los Angeles for vacation and discover the nefarious plan of oilman Tex Richman (Chris Cooper) to raze Muppet Studios and drill for the oil recently discovered beneath the Muppets’ former stomping grounds. All seven films have signature soundtracks that received countless awards, including an Academy Award® nomination for Best Song for “Rainbow Connection,” Best Original Score for “The Muppet Movie” and winner of the 2012 “Best Original Song” Academy Award® for “Man or Muppet,” from the “The Muppets” (2011). In addition to feature films, Muppet mania continued long after “The Muppet Show” ended its run. Many television specials and documentaries featuring the classic Muppet characters have been produced. Muppet Magazine was published from 1983-1988 and “The Muppets” comic strip was syndicated in U.S. newspapers from the early to mid 1980s. Museum exhibits (“The Art of The Muppets,” “The World of Jim Henson: Muppets, Monsters & Magic,” “The Vision of Jim Henson” and others) featuring Muppet characters toured domestically and internationally from 1980-2001. Multiple record albums for “The Muppet Show,” “Muppet Babies” and all of the Muppet movies have been released worldwide. Hundreds of Muppet books have also been published around the world since 1976. 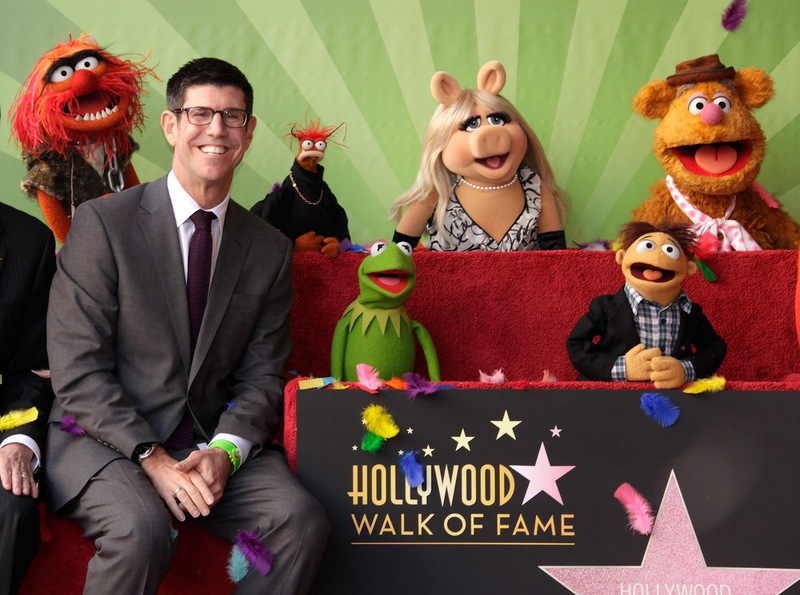 Throughout the years the Muppets have also produced numerous public service announcements and have acted as spokespeople for many causes both domestically and internationally, ranging from The National Wildlife Federation, UNICEF and the American Film Institute, to the University of Maryland, the American Library Association and the Better World Society. Kermit regularly appears as a giant balloon in the Macy’s Thanksgiving Day parade in New York City. One of the year’s best-loved family comedies and among the best reviewed films of 2011, Disney’s “The Muppets,” starring Jason Segel, Academy Award®-nominee Amy Adams, and favorite celebrity couple Kermit the Frog and Miss Piggy -- debuts March 20 on Blu- rayTM Combo Pack, DVD, Digital Download and On-Demand formats. A must-own movie the entire family can enjoy, Disney’s “The Muppets” in-home release includes the DVD and digital soundtrack packaged together and also offered as the ultimate Muppets experience, a ‘Wocka­Wocka Value Pack,’ which contains the movie on Blu-ray high definition, DVD and Digital Copy (three discs), plus a download card which allows fans to own all the songs including Bret McKenzie’s Oscar®-winning “Man or Muppet,” from the film’s hugely popular soundtrack from Walt Disney Records.